The Shimoda Explore camera bag system was born as a result of the pain, fatigue, and suffering we and our adventure photographer friends found ourselves facing in the mountains. We created a system designed to function in - and stand up to - the extreme mountain conditions we inevitably face. We created the Explore 40 for fast moving and agile adventure photographers who need to be in the action to document their story. It was designed to simplify their shooting experience while minimizing physical fatigue. Its intuitive design ensures essentials like food, water and a smartphone are always in immediate reach. • Side and rear access. Ready for any and every adventure, the Explore 60 redefines the way serious adventure-bound photographers pursue their passion. We wanted the user experience to be simple and intuitive while ensuring its carry performance minimizes fatigue and stress. With side and rear access to gear, a height-adjustable shoulder harness and direct access to food, water and mobile devices, the Explore 60 helps keep adventurers moving forward with limited interruptions. 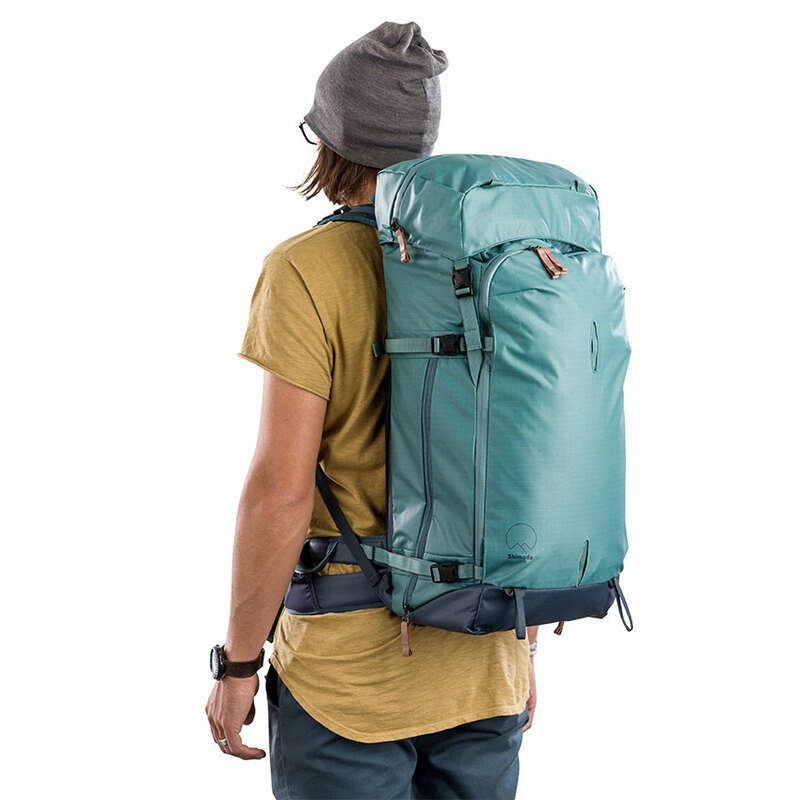 Approximately 15 liters of adjustable volume via a floating lid lets the most demanding photographers take on multiple adventures without needing to compromise their gear carry needs. The floating lid also provides a secure way to quickly fasten jackets, touring skins and other adventure gear. Lightweight, durable and intuitively functional, the Explore 60 is destined to be a new favorite addition to the demanding adventure photographer’s toolkit. • Side, rear, and top access. Camera Inserts are an amazing modular development for camera bags, but previous designs have suffered from limited uses as well as excess weight and materials. Most insert designs force you into a single size choice that often leads to numerous expensive purchases of different sized inserts to satisfy various packing needs. We rethought modular camera inserts. Shimoda offers multi-configurable Core Units in Small and Medium sizes. Combined or alone they allow for side, rear and top access configurations. 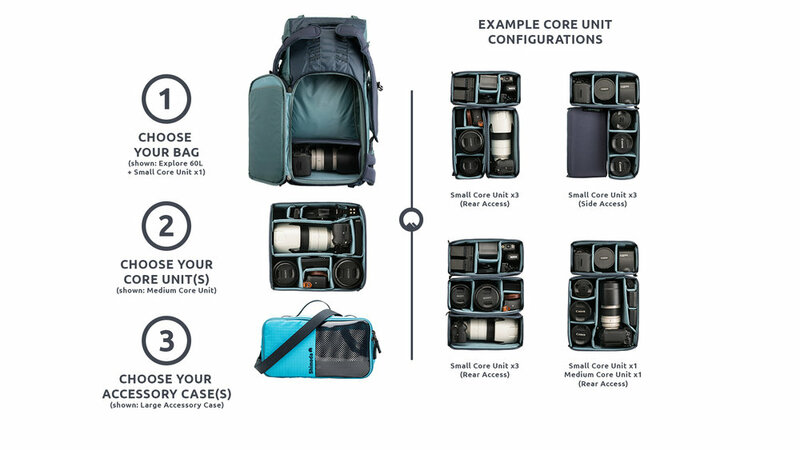 Our 2-size system offers over 10 insert configurations to customize the amount of camera and adventure gear for the day ahead of you. Shimoda Core Units are constructed with compression molded EVA sidewalls and dividers providing optimal protection without excess weight or materials. • A sealed dust-free storage case when your camera gear is not in use. • A packing cell for an added layer of organization for loose items like clothing, food and safety equipment. • A convenient, lightweight shoulder bag (with camera insert) for a quick hike out of basecamp or a walk around a new city. Shimoda has developed three sizes of Accessory Cases in order to provide the smartest modular storage solution for an adventure photographer’s needs. Whether carrying portable hard drives, batteries, remotes, a sound kit or lots of smaller items like cables, our translucent shell and internal sub-compartments ensure a fast and organized workflow. Built with high-quality, lightweight and water-resistant materials, its clamshell opening lets the case hang open via its buckle-release handle. This simple feature allows it to be hung from a tripod collar or similar object to make set up and take down fast and efficient. Shimoda Accessory Cases work seamlessly with every other product in the system. They fit into the packs and roller to ensure no space is ever wasted, while also allowing for a speedy packing and transition experience.